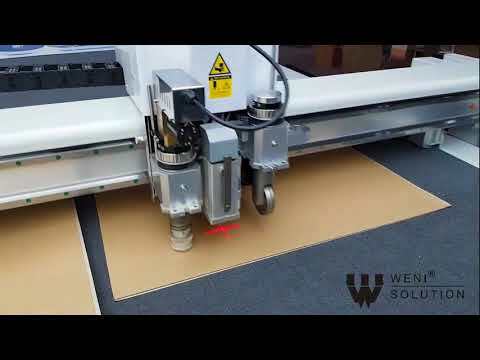 Weni WB03II is an advanced and reliable creasing – cutting flatbed cutter. 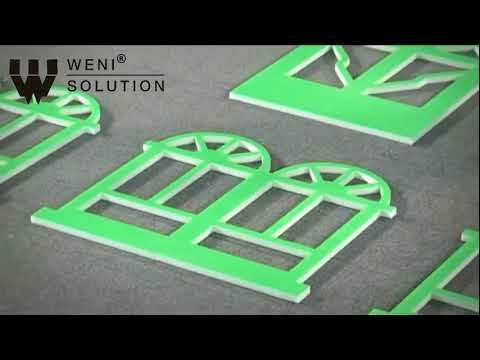 Weni WB03II is an advanced and reliable creasing & cutting flatbed cutter of second generation. It allows creasing, incisioning, cutting and milling sheet materials as well as the on roll ones (rigid and flexible). It is dedicated mainly to industries like: textile, clothing, advertising, furniture and upholstery. Plotter is equipped with an roll holder that allows you to automatically extend and cut projects larger than the table length. During the auto expand the role of the vacuum system material changes in airflow to evenly distribute the material on the work table. The table is divided into 6 independent vacuum system sections (with full control via a touch screen LCD), so that even the smallest workpieces will be solidly maintained in position during the machining process. Thanks to the modular head and the use of two tools in one work cycle, the entire production process runs smoothly and quickly. The positioning system used by the laser and the CCD camera allows you to perform cutting on the contour with high precision, no matter of the material conduct or placement on the table’s working area. 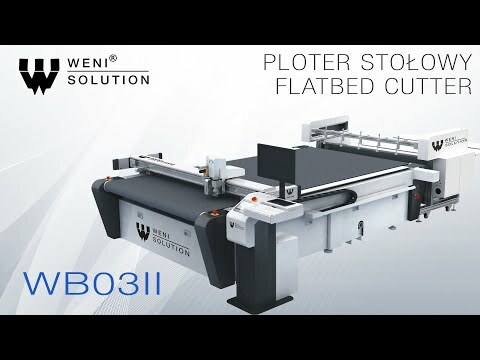 Extending the device with an additional automatic loading and unloading system for sheet materials makes the WB03II cutter a fully industrial production device. Automatic recognition of the tool lengths combined with digital and mechanical adjustment of cutting depth ensure precise cutting of materials such as: paper, textiles, foils, leather, plastic, PVC, acrylic, plexiglass, banners , tarpaulin, rubber, wood, cardboard, plywood and much more. A high-speed spindle of the well-known Japanese brand Nakanishi with a power of 360W and a speed of 60,000 RPM with full control of servo controllers. Equipped as standard with interchangeable milling cutters in 3 different sizes. Electric oscillating knife for cutting soft materials. It comes in two versions with the possibility of cutting material with a thickness of 25 mm or 50 mm. *. Perfectly sharp knife V-Cut knife is a tool for incision and cutting soft materials. The adjustable blade angle allows you to make cuts across the material in different angles: 0 °, 15 °, 22.5 °, 30 °, 45 °, and processing of materials up to 18mm thick. Highly precise active knife for incision and cutting materials up to 2mm thick. Tool for cutting mainly elastic materials up to 8mm thick. Two types of disc knives with low resistance. The motorized rotary knife allows for quick work. Proper knife pressure allows easy separation of each cut fiber. Ideal for cutting fabrics with extreme precision. This tool is ideal for cutting most soft materials with a maximum thickness of 5mm. As standard, it is equipped with 45 ° and 26 ° knives. A tool for drawing lines of cutting, creasing and stroke. Precise marking solution directly on the material. There are two versions that can be freely exchanged, gel or ink pen.